Juanita Louise Sample, age 87, of Marble Hill, MO died Sunday, April 6, 2008 at Eldercare of Marble Hill. She was born June 24, 1920 in Lutesville, MO, daughter of Jacob M and Laura M Eaker Hahn. 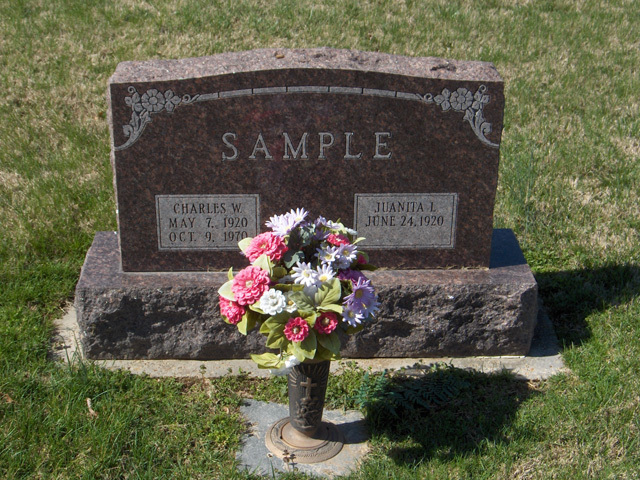 She married Charles Sample and he died on October 9, 1970. Mrs. Sample was a homemaker and a faithful member of the United Methodist Church in Marble Hill. Survivors include: two sons Glen Sample of Cape Girardeau, Ivan Sample of Marble Hill, four granddaughters and three great-grandchildren. She was preceded in death by her parents, and three brothers, Willard, Eldon, and Milford Hahn. Visitation will be Tuesday, April 8, 2008 from 4:00 to 8:00 PM at the Liley Funeral Home in Marble Hill. Funeral services will be Wednesday, April 9, 2008 at 11:00 AM at the funeral home with the Rev. Michael Kelpe officiating. Burial will follow in the Bollinger County Memorial Park Cemetery near Marble Hill.